Chinese cooking has always held a prominent place in Chinese life. In fact, in Chinese culture, food seems to be at the epicenter of all significant events… births, weddings, deaths, the new year… they are all honored with food at their core. Chinese cooking has been celebrated since ancient times. 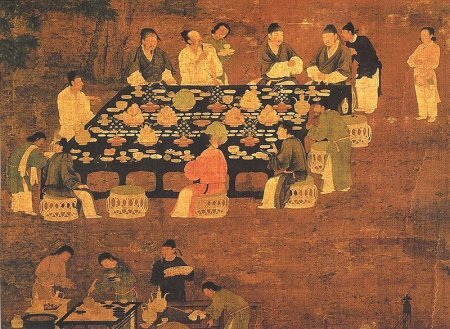 At the imperial court, food was at the heart of rituals and ceremonies. Just to give you an indication of how important food was considered even back then, out of the near 4,000 people that worked in the palace, the emperor had at his disposal an army of over 2,200 people dedicated to the sole purpose of looking after the imperial meals! Rice has been farmed in China since ancient times. In the north where rice did not grow because of the climate, millet was farmed. 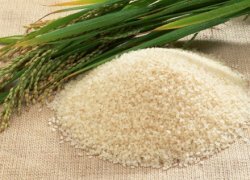 These basic grains constituted the mainstay of the Chinese diet. Soybeans are also native to China and constitute an important part of the Chinese diet. 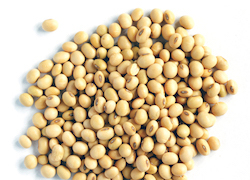 Soybeans are rich in protein and the main ingredient in Tofu. From soybeans we also get soy milk and soy sauce, the ultimate Chinese seasoning. Soybean sprouts accompany many popular Chinese dishes. 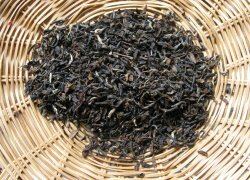 Tea as well, has its roots in China. You could say tea is China's national drink. It is part of everyday life as well as Chinese traditions and culture. As part of the wedding ceremony, for example, the bride and groom serve tea to their parents as sign of appreciation. Through the centuries, many foodstuffs were introduced in China by traders. Peanuts for example, were brought in by the coastal merchants in the Ming dynasty. Chinese cooking uses a great variety of ingredients, and some might appear to us a bit exotic, lotus roots or rare vegetables for example. The use of these unusual foods in most cases was actually a need to be resourceful and utilize everything possible to survive, also denoting the flexibility and adaptability in Chinese cooking. On the other hand, some of this "exotic" foodstuffs are considered delicacies by the Chinese and often prepared for special banquets. It is a compliment to the guests to offer some rare and often expensive items as part of the meal. Bird’s nest soup is one widely known delicacy. The bird nests are gathered from cliffs which are hardly accesible, require a great deal of cleaning and preparation. This soup is served as a "prestige" dish at banquets and special occasions. 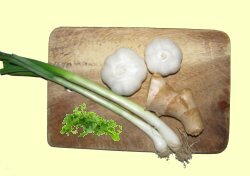 The main fresh ingredients used for flavoring include fresh ginger, garlic, Chinese Parsley or coriander/cilantro, and spring onions. 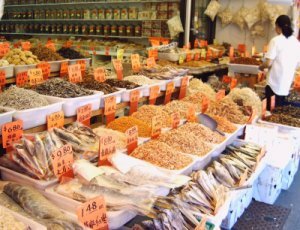 Click here for more on Chinese food ingredients and essentials in your Chinese kitchen. Chinese Cooking Methods are the same methods familiar in the West and consist mainly of boiling, deep frying, braising, roasting, and the ever popular method of stir frying. Stir frying involves stirring ingredients in bite size pieces in very high heat with very little oil and is considered indeed very healthy because of the minimum amounts of added fat and because of the quick turn around, the vegetables stay crisp and retain most of their vitamins. The traditional method of cutting up the food into small pieces before cooking evolved from the need to conserve fuel. Forests are scarce in China, so wood for heating was used sparingly. The smaller the pieces, the faster they would cook and the more fuel could be saved. In stir frying, all ingredients, meats, vegetables, seasonings, must be prepared and measured ahead of time. The cooking time could be as short as five minutes from start to finish, which does not give you much time to "prepare as you go" and having everything ready is essential to avoid overcooking the meal. 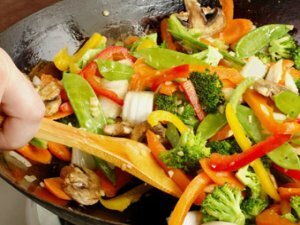 Even though you can use a frying pan or saucepan, cooking with a Wok is often the preferred utensil for stir frying because of its round deeper shape, you can toss and stir the ingredients without them falling all over the place, and the thin and higher walls of the Wok provide the quick heat necessary in stir frying. 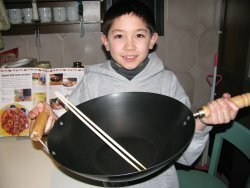 The Wok is a fairly new invention and a handy utensil to have. In addition to stir frying, you can braise, deep fry, boil and steam in it! Besides the wok, these are some other handy Chinese Cooking Utensils widely used in Chinese Cuisine.